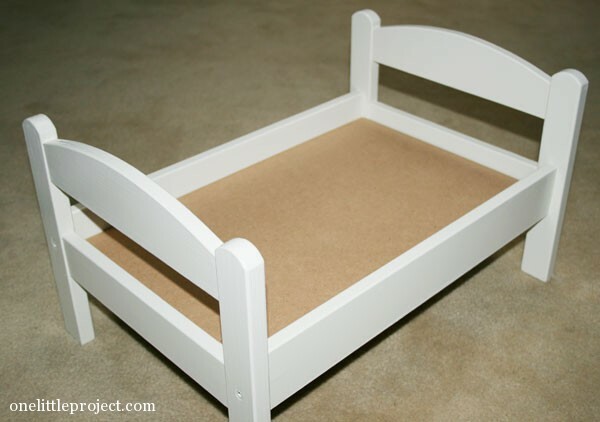 Since we are already on the topic of painting beds this week, I thought I’d continue by painting the IKEA Duktig Doll’s Bed that we gave Leah for Christmas this year. 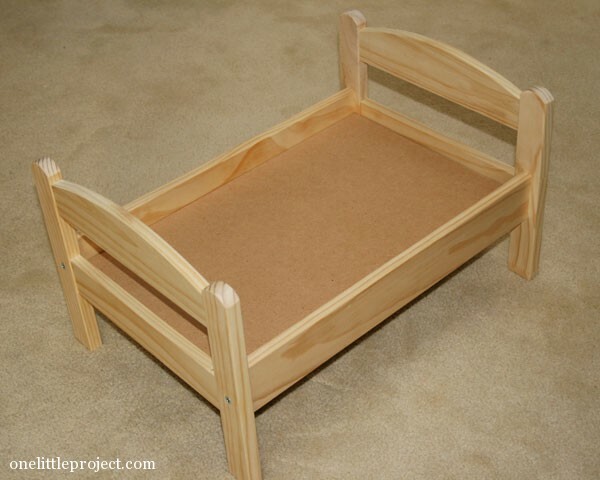 It’s a simple wooden bed frame (doll sized of course) and it comes with some very simple bedding and a flat looking thing that’s supposed to be a pillow. 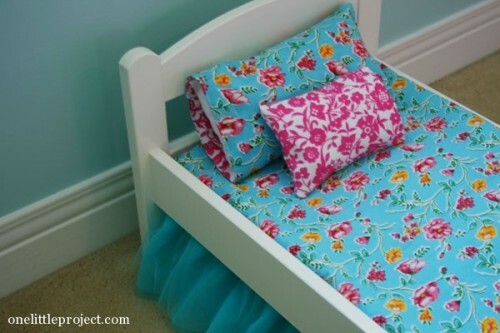 I have big plans to dress up this bed with fancy bedlinens and make it a little more inviting for her dolls and stuffed animals! 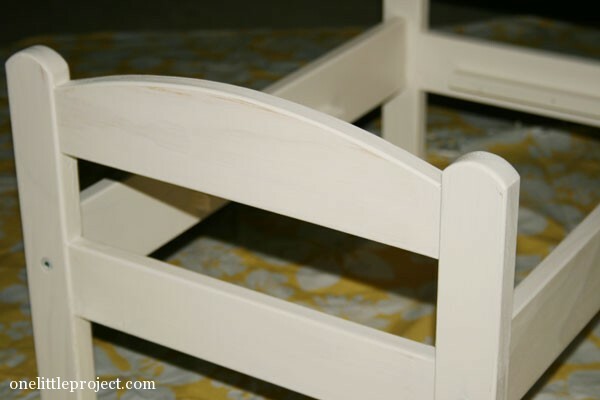 I’ve been planning to paint it white to match the other furniture in her room, but it has taken awhile to get around to it. 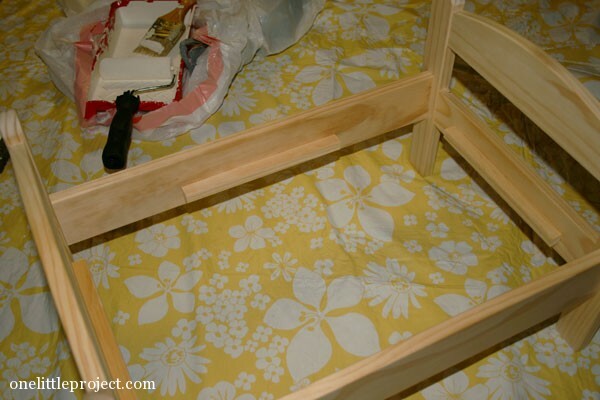 Luckily I left the paint brushes, and the paint tray in a sealed bag from when I painted Leah’s headboard last week, so everything was ready to go and all I needed was the time to do it. 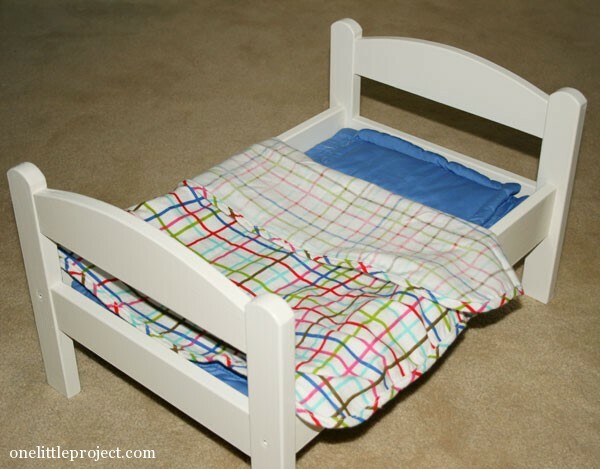 This is the second piece of furniture that I’ve painted (if you can call a doll’s bed furniture). 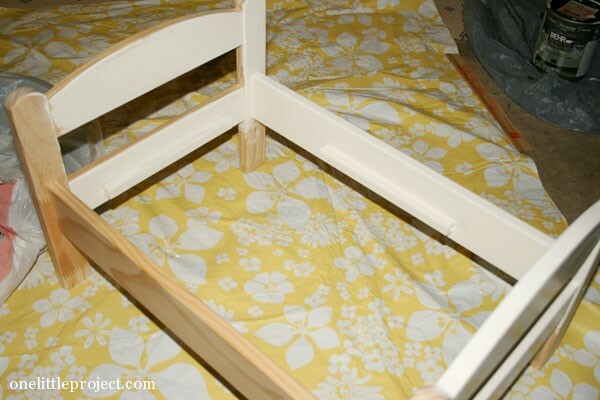 I was kind of surprised that this was a lot more work to paint than Leah’s headboard! I used a small brush to paint most of it. It was a lot of really small areas at very awkward angles. 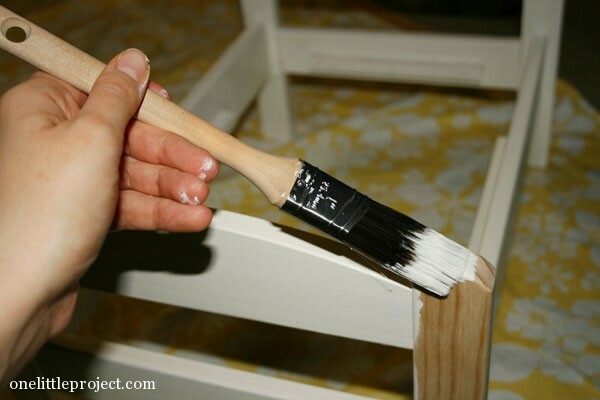 Each coat took a good half hour to paint, if not longer. I tried to put the first coat on thin, but I think my paint is just too thick. 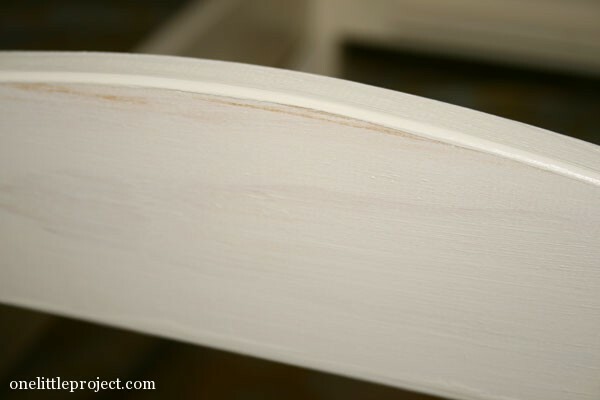 Next time I buy paint for furniture I’ll have to make sure it’s quite a bit thinner and hopefully that will help get the smoother finish that I want. After the second coat it was good to go! 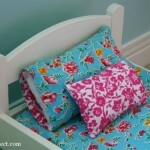 A pretty little doll bed to match Leah’s big girl bed! 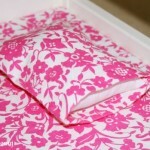 I have to make some better bedding than this, but at least the doll’s bed is now painted white! 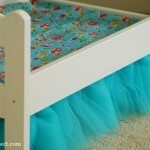 It’s going to look really cute in Leah’s bedroom when I get all the bedding put together. 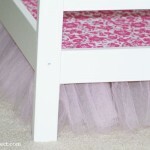 I’m planning on doing another tulle bedskirt (I just can’t resist! 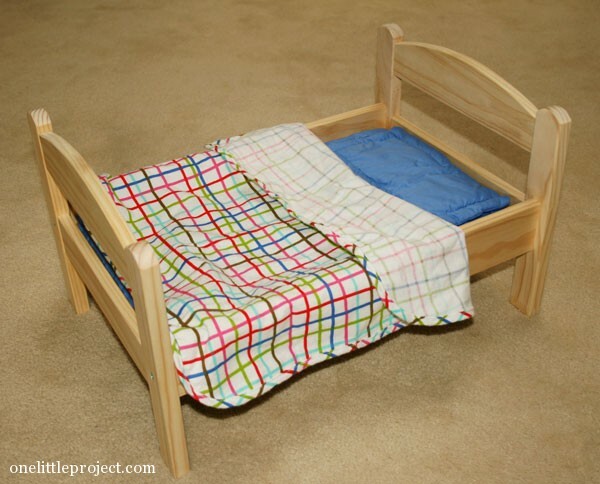 ), a pillow that actually resembles a pillow, a mattress of some kind, and some sheets. As always I’ll have tutorials for all of it so be sure to check back!